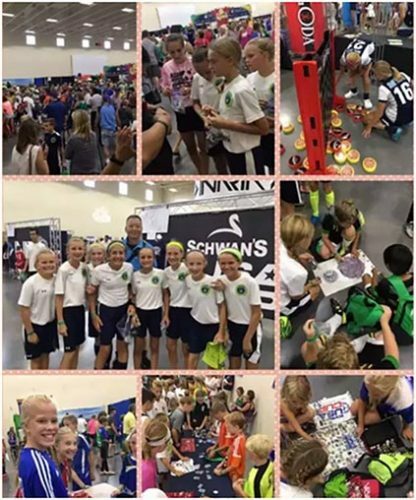 In the American Cup, children from all over the world communicate with each other and make friends through football. On the outside of the American Cup, the children took their stories away with pins. 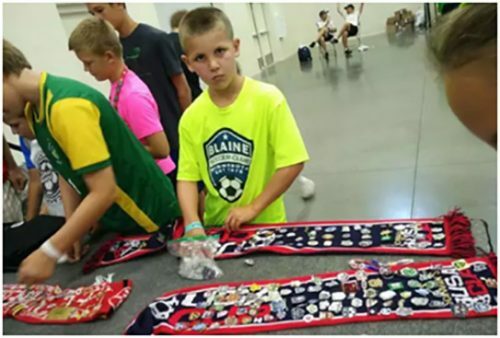 Every child who participates in the American Cup often holds a pin of his own club. 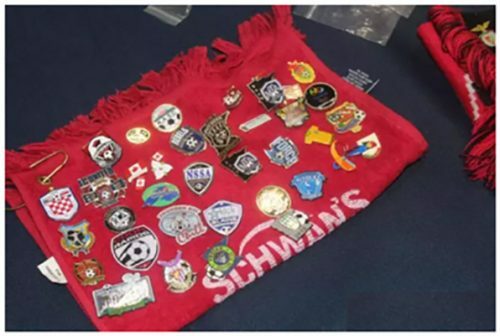 Every year the clubs prints new trading pins and sends them to each child to exchange them outside the US Cup. In the eyes of children, these little pins are precious. Behind the pins is the emotion of American Cup which belongs only to children. 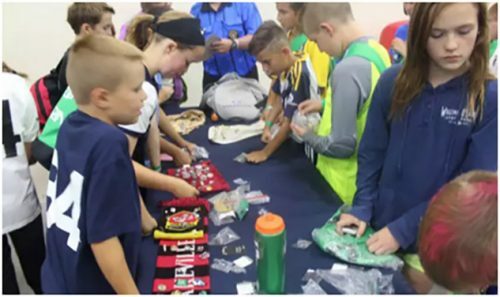 During the American Cup, wandering at the gate of Port Expo Center, we can often see children of different countries and colours wearing their own team uniforms and talking happily. Approach them and you will find that the theme of the children is always pins, pins, pins… Occasionally, some bold children can be heard chasing past people and asking “Do you have any pins to trade?” If the pedestrian smiles, nods and opens his backpack, the child will be thrilled by the pins he has courage to exchange back. When a child gets a pin from other countries, he will be as happy as a treasure. After all, the pin from other countries is the fate of crossing the ocean. Walking into the exhibition center, countless children create a noisy atmosphere that makes people feel much younger, youthful, energetic and noisy. 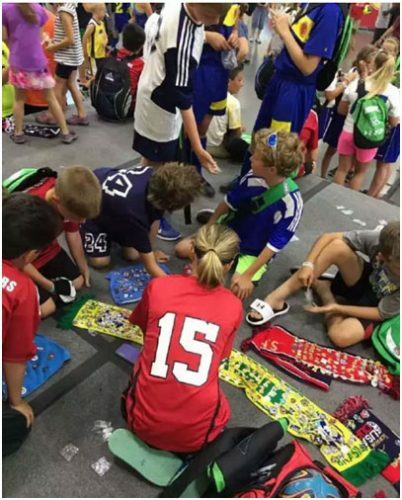 The place where children gather most is always the pin trading zone. Children open their own collections separately. Countless pins are carefully pinned to towels, scarves, schoolbags, and the lights shine. The more pins they have, the more admired they will be. If someone approaches every child and asks them about the origin of any pin, the child will show off the memory behind them. “We play against Brazil, they are strong. They won the game but we did well. After the game, we exchanged pins. It’s very cool! The pins can also be seen as a symbol of a player’s game experience. Players who participate in a variety of competitions usually hold a variety of pins. They come from all over the world. They not only have medals of honor for participating in various domestic and foreign competitions, but also have special memories exchanged with other players. 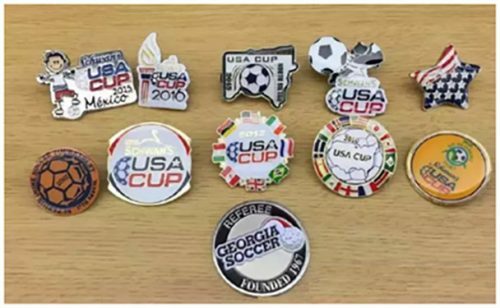 The Organizing Committee of the American Cup specializes in customizing different styles of enamel pins for players who love to exchange pins every year, which makes every American Cup a part of their football career. 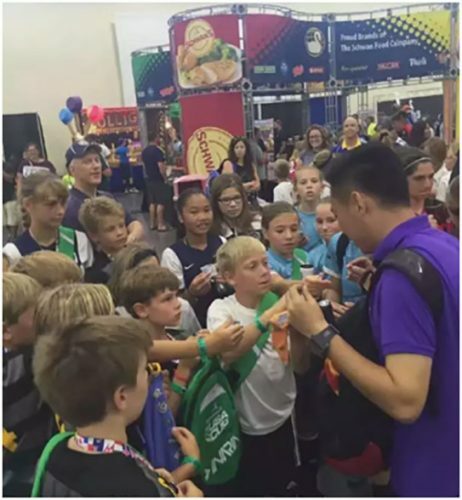 Many parents accompany their children to the U.S. Cup again and go back to the place where they played football when they were young. It’s amazing to see that 20 years later, the children still enjoy talking about a pin. “This is the second time I’ve brought my son to the American Cup. He likes it very much. He likes to take our pins and exchange it with others. I’m very supportive of him because I liked it when I was his age. 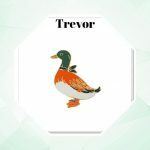 He reminded me of my childhood.” As she said, the mother showed me a 1990 American Cup Pins, and her child smiled proudly at me. We often talk about popularizing the football population and improving teenagers’ love for football. After consuming a lot of manpower and material resources, we feel that the effect is not ideal. The children participating in the American Cup seem to be enjoying the happiness brought by football. Instead of utilitarian football, they pay more attention to the value of the sport itself. Let children like football, and remember the joy and touching football brings them, the American Cup with a pin did it. 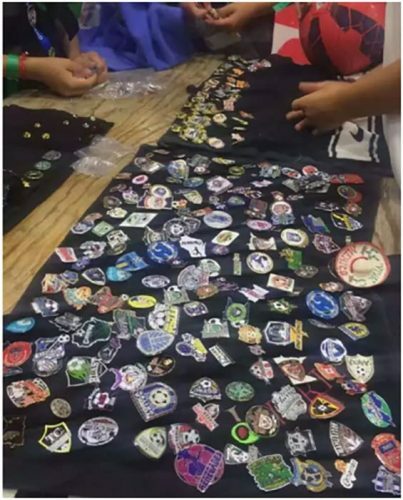 So do you know where to buy the club trading pins? GS-JJ provides you with a good choice. 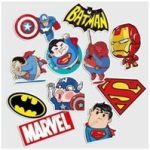 We can provide custom trading pins free of design fees for all types of sports: football trading pins, baseball trading pins and other sports pins etc. 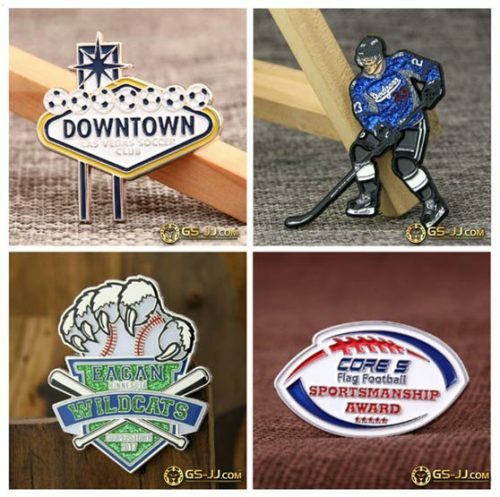 Whether you want to customize one or a large number custom lapel pins, as long as you click: https://www.gs-jj.com/trading-pins/Custom-Baseball-Trading-Pins, you can enter our customized system to place an order.